Aw…you say she is talking about her own wine? Well, frankly…I am! I just got back from a wonderful cruise in the Mediterranean. We sailed from Rome to Venice. It was a fantastic vacation and I can’t wait to go back. We visited Rome, Sorrento, Sicily, Zakynthos and Corfu, Dubrovnik and then Venice. It was absolutely beautiful. The food and wine were awesome, and the landscape was gorgeous. Waking up in the early mornings to see the sunrise was spectacular. Walking among the ruins at the Colosseum was life changing and walking through the Vatican was priceless. Upon my return, still suffering jet lag, it was time to hit the ground running. I had to get ready for the Passaggio Wines 2013 Spring Release Party scheduled at the tasting room in San Francisco a mere 4 days after my return. We had a great turn out – approximately 65 – 70 people. Of the 2012 vintages, I poured Passaggio Unoaked Chardonnay and Pinot Grigio, UNMARKED Sauv Blanc, Passaggio Rose Colored Glasses, and the 2011 UNMARKED Pinot Noir. 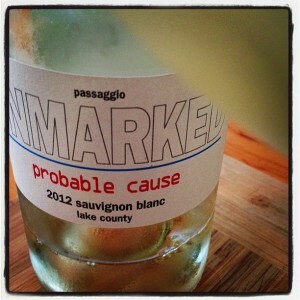 The hands-down favorite white of the night was the 2012 UNMARKED Sauv Blanc. You can purchase this wine at the tasting room in San Francisco or on-line at Passaggio Wines website for $18 retail. Alcohol 13.2% by volume. This wine was fermented and aged in stainless steel drums. It has layers of lemon grass, gooseberry, grapefruit, citrus, and a slight floral on the nose. You will find on the palate a vibrant lemon tart, citrus, grapefruit, pineapple, a slight lemon grass and a balanced acidity. This is a great wine for summer! Cheers and Happy #Sauvblanc Day! !